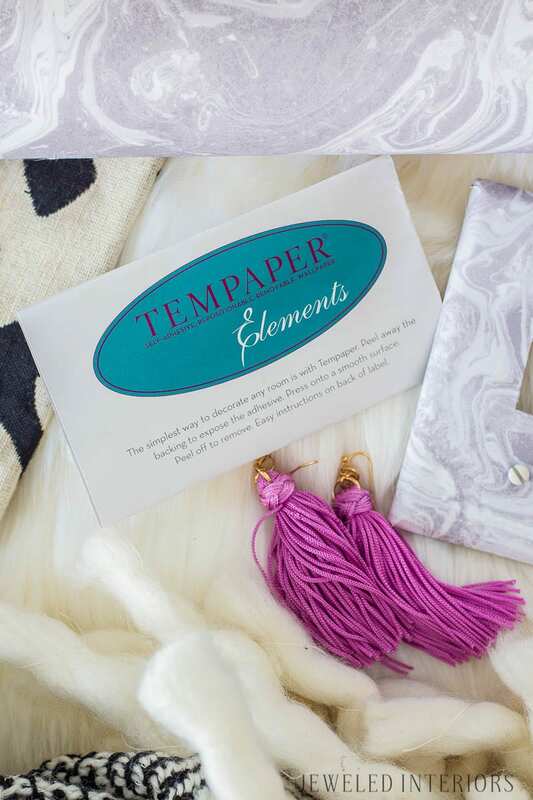 I want to thank Tempaper for sponsoring the product I used today. The opinions are 100% my own! HI folks! 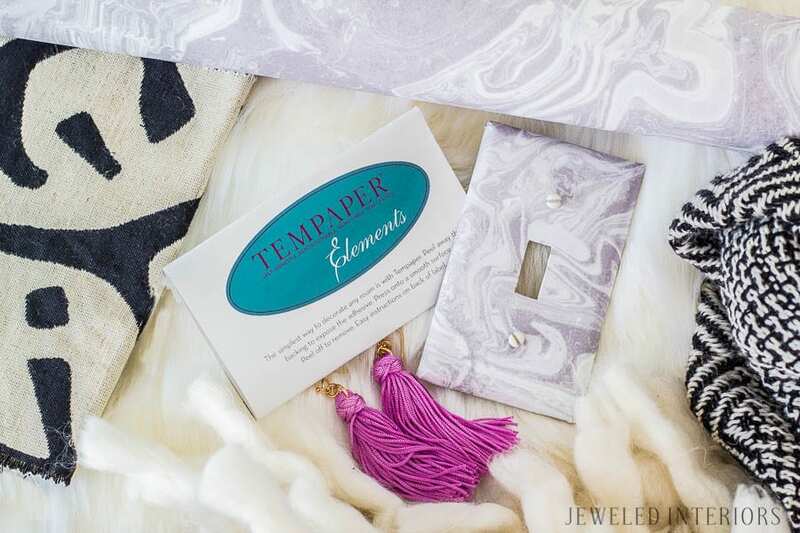 In response to all of the great questions I received about my last post, I wrote this description and tutorial about my new favorite renter friendly product…Prepare yourselves for this Tempaper installation tutorial! Want the exact same wallpaper? It’s called Tokyo in Ash. 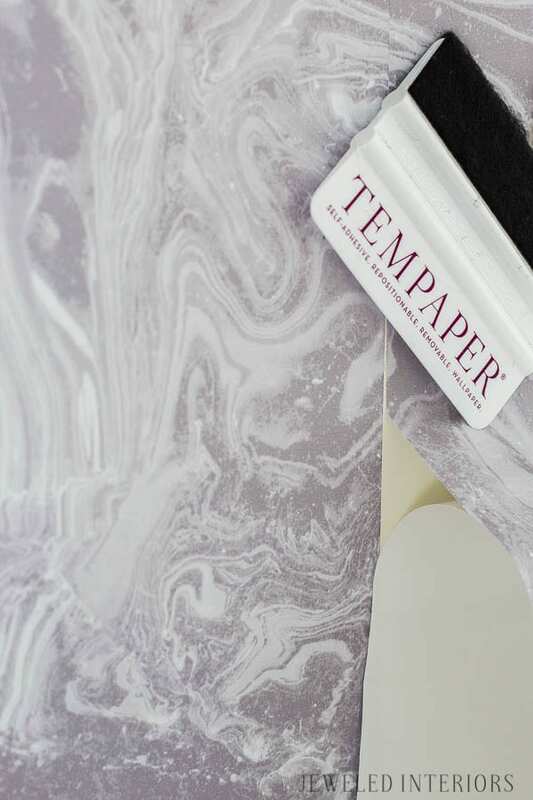 So WHAT is Tempaper you asked? The best way I can describe it is a REALLY LONG piece of vinyl that you hang on your walls like wallpaper. It has a matte finish and no texture. The backside is sticky, but not annoyingly so. Several times I accidently let two adhesive sides stick together, but it didn’t take much effort to pull them back apart. I was worried that I wouldn’t be able to reposition the Tempaper if I didn’t line it up correctly. Thankfully my fears were abated after my first mistake. It came right off my wall, no problemo. I will say, however, that the company told me the recommended paint surface for Tempaper is egg-shell/satin/semi-gloss finished walls. If the product is applied to flat/matte/ finsihed walls, in some cases, upon removal it may pull off some paint. Even though Tempaper is recommended on smooth surfaces I experimented by daringly attempting to cover up shiplap in this 10 month rental. I grit my teeth, held my breath, and eventually gave myself a high-five once I realized that it was actually going to work! 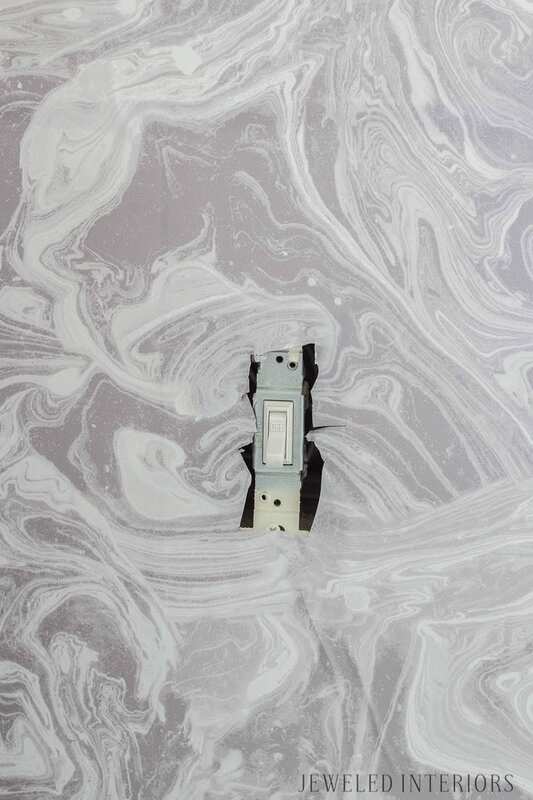 Would it be even more fab over a completely smooth surface? Probably. If it can cover shiplap, however, this is pretty great stuff. 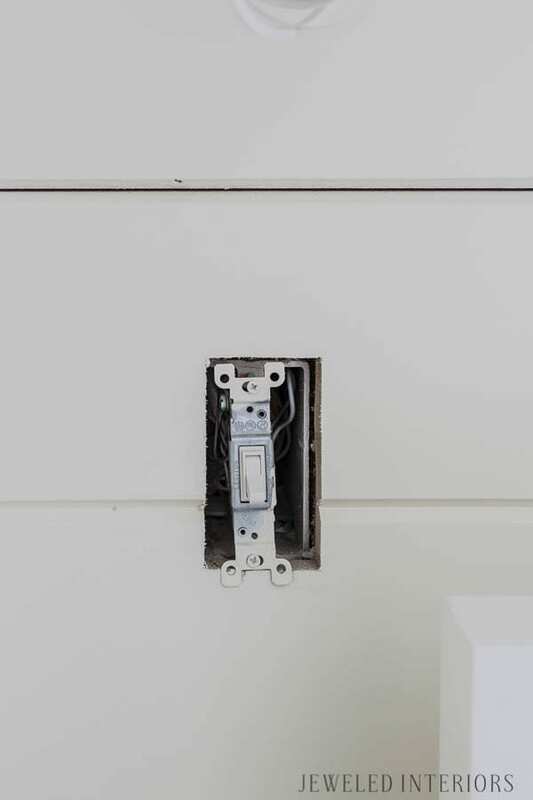 Don’t forget to remove all light switch plates, sconces, art, etc. 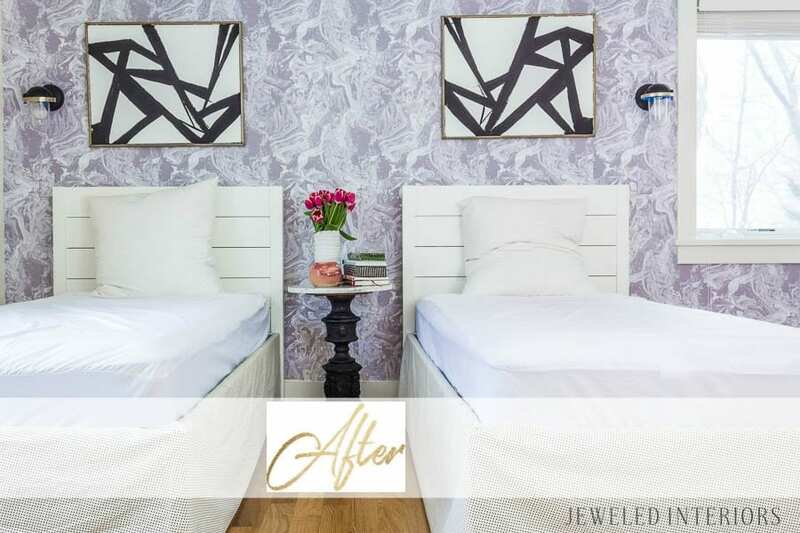 I’m not going to judge you if you purposley opt to not wallpaper behind a large piece of furniture as long as you are 100 percent certain you will never want to do any rearranging during the life of your wallpaper. Either way though, I learned the hard way that you will have to move the furniture well out of the way or the paper sticks to it as it gets smoothed down the wall. NEWS FLASH! 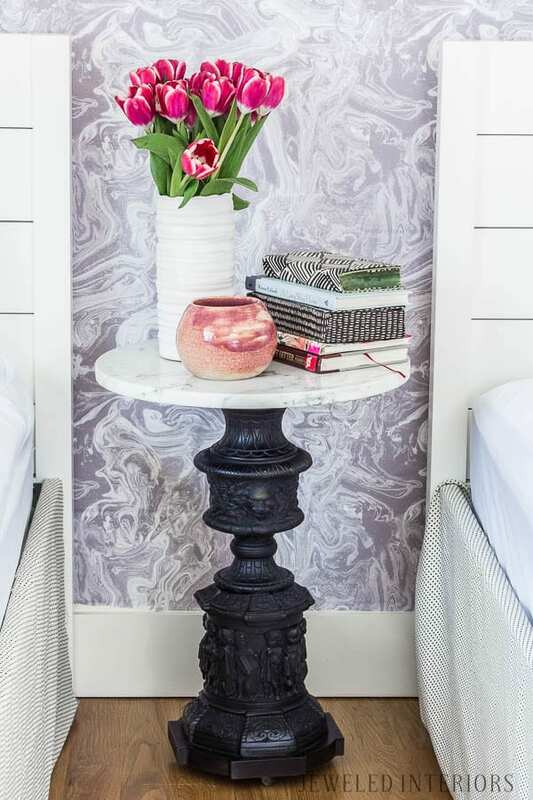 Your walls may not be 100 percent straight! Yep, a case of crooked walls is even more likely if you find yourself in an older home. The solution? It’s easy really. Simply use a plumb line if you have one, or more likely, pull out your long level to establish a perfectly straight vertical line on your wall. You can mark this off with a chalk line or a piece of tape. This oh-so-special line will be the starting point for your project…The line by which you judge all of the other lines. To be honest with you, my lines were no longer straight by the time I reached my last section of wallpaper. Luckily for me, though, the pretty pattern was so busy that you can’t even tell. Had this been a geometric pattern, however, I may have been in trouble. I imagine I would have needed to use the level with each strip of wallpaper. The directions state to measure the paper (leaving a few inches on each end) and then cut. I found it useful to first line up my pattern, then eyeball a couple of inches at the top and the bottom. Most wallpapers have a “repeat” or a place where the pattern starts over. 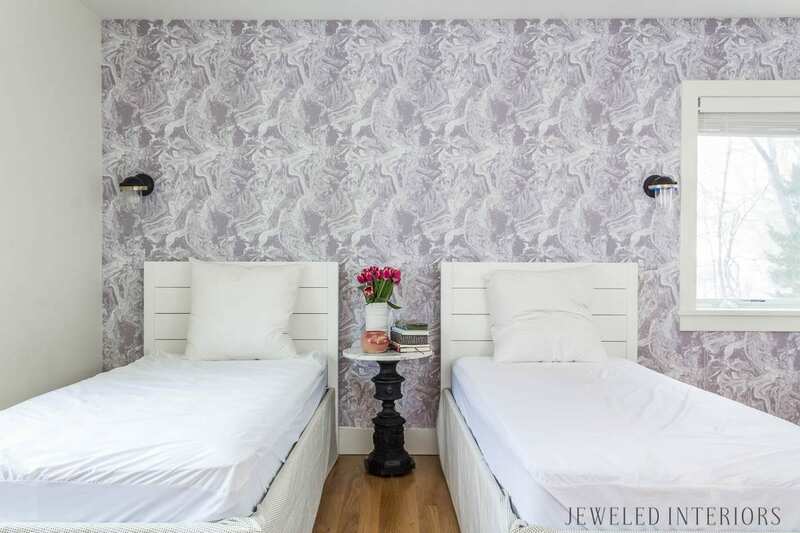 It is important to find your repeat and ensure that your wallpaper matches up. You can see that I left more than this amount in the image below. The disadvantage to this being that too much sticky wallpaper above or below clings to everything and makes the task much more challenging. So what do you know, the directions were actually right :). Find the repeat again and figure out how the pattern should match-up. I found it useful to line-up a small amount along the top, but to then pay special attention to matching the pattern on the way down. There was a lot of attempting to match, realizing that I hadn’t quite nailed it, pulling up a section, and trying again. Did I mention that this stuff is repositionable? Phew! 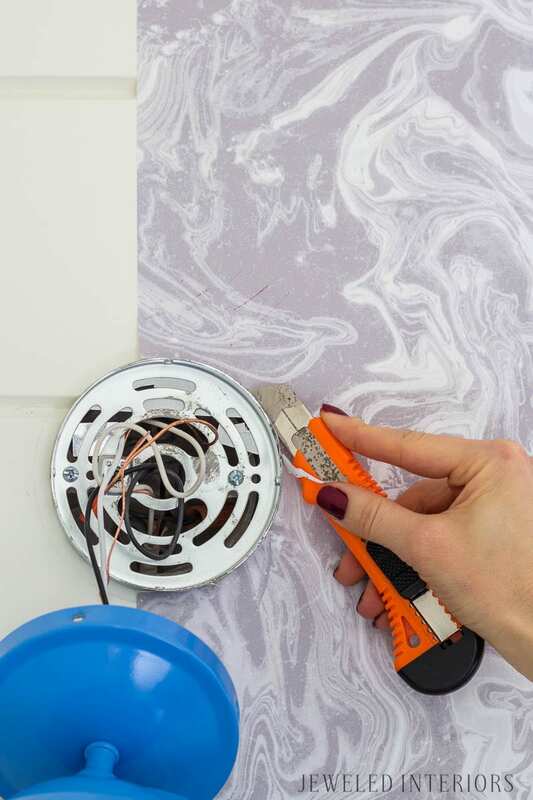 Working in small sections and starting in the middle of each piece of hung Tempaper, use your hands and this nifty squeegie tool to smooth the bubbles outward. 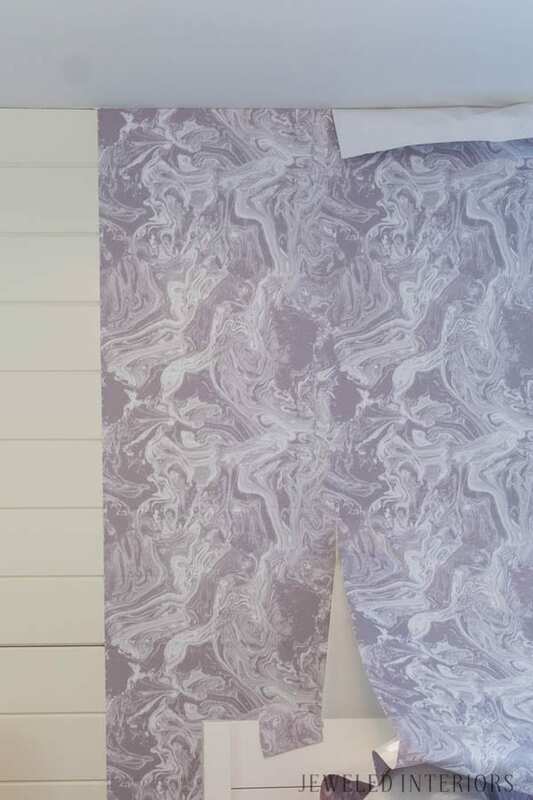 I’m going to guess that most walls have a little somein’ somein’ to test your wallpaper skills. This may be in the form of a light switch or electrical socket. No sweat! Pull out your ol’ exacto knife and simply cut around it. Speaking of your Exacto knife, keep it handy for trimming the tops and bottoms of your Tempaper. 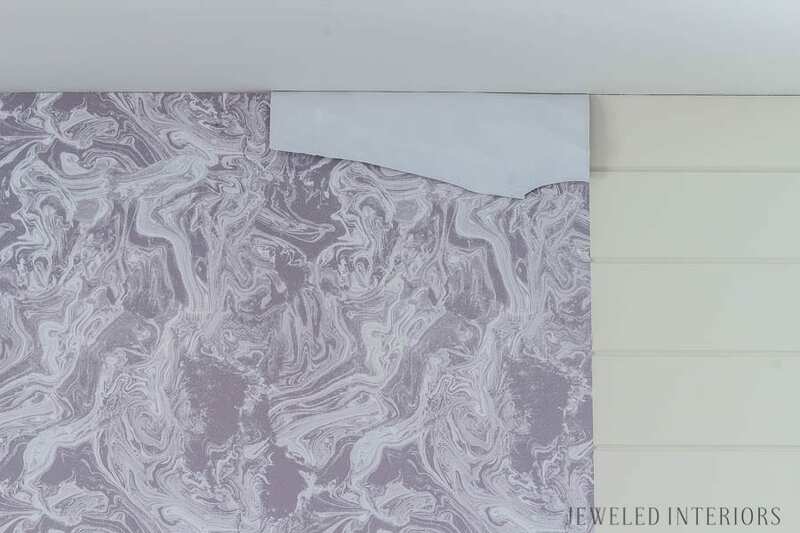 Once this step is complete your wall starts to look pretty polished. This step is optional, but I think it is well worth the extra couple of minutes required. 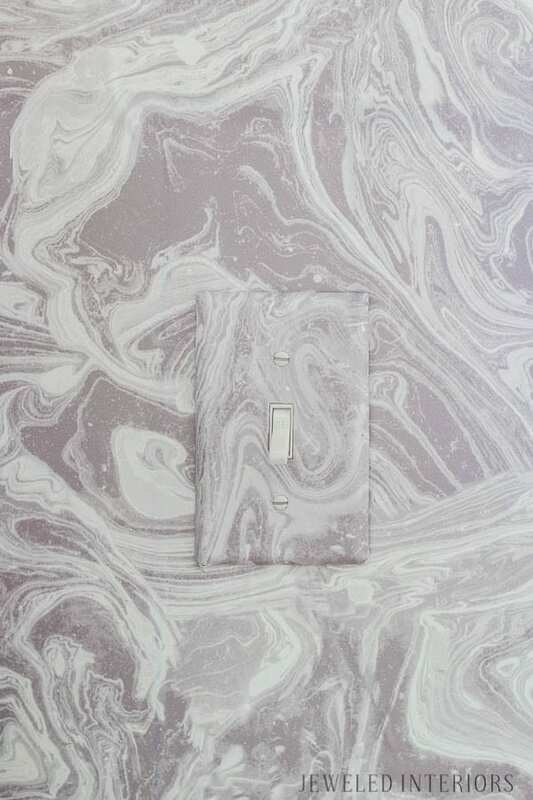 Using some of the scraps left over from your wallpaper, cover your light switch plates. This helps your eye focus on the pretty wallpaper vs the ugly piece of plastic on your wall. 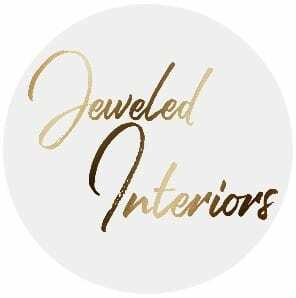 Also, pin to your heart’s content and don’t forget to follow me👇 if you are interested in eclectic glam decor and DIY home projects.